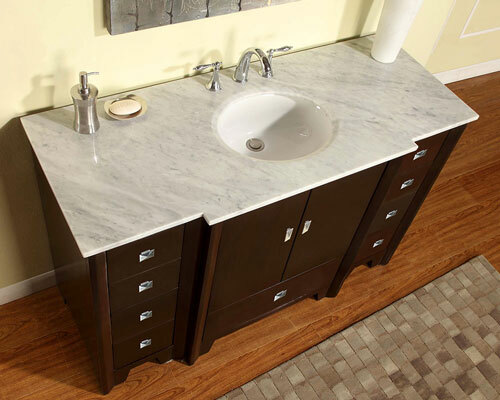 Blending together the sleekness of Espresso with the beauty of Carrera Marble, the 55" Galos Single Bath Vanity makes a beautiful replacement for any bathroom that needs a makeover without going too far into urban styles. 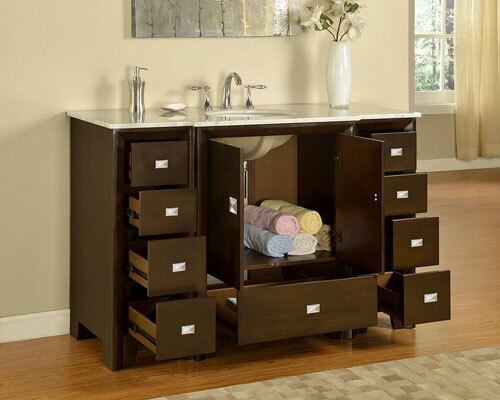 Its simple cabinet is finished in an Espresso finish and adorned with metal accents, showing off the double-door cabinet and nine fully-functional drawers. Its Carrera White Marble top is matched with a white ceramic undermount sink and is pre-drilled with three faucet holes. Faucets are sold separately.